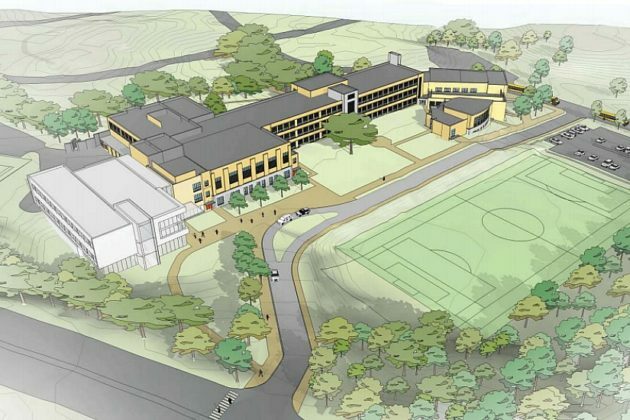 Rendering of the new middle school on the Stratford School site. 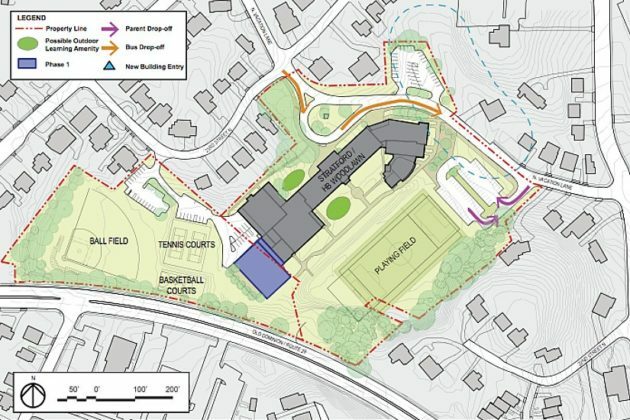 The Arlington County Board, during an hours-long meeting on Saturday, debated whether to include a controversial driveway feature in the design for the forthcoming Stratford Middle School in Cherrydale. Though the Arlington School Board approved the school’s design in November, the project’s designers, county staff and some neighbors have come to an impasse on whether that design should include a one-way driveway connecting N. Vacation Lane and Old Dominion Drive. Proponents of the plan with the driveway — including its designers and some locals — argued the one-way avenue is needed to mitigate traffic in the area and would give the new school a much-needed area for pickup and drop-off. But opponents of the plan said building the driveway would negatively impact the environment by removing 166 trees from the site and would send hundreds of vehicles directly onto Old Dominion Drive, among other concerns. Among those arguing against building the driveway is Dennis Leach, deputy director of transportation for Arlington County. “The driveway causes adverse environmental impacts to the site and is not essential for transportation access,” he said. But Vern Torney, a traffic expert hired by a community organization dubbed the Coalition for a Safe Stratford, said the driveway plan would actually help the environment, albeit in a different way. Members of Arlington Public Schools’ Building Level Planning Committee (BLPC) also supported the plan to build the driveway, citing reduced risk of pedestrian and cyclist injuries and better accessibility and emergency access. After hearing hours of concerns and comments from members of the community and other interested parties, the Board’s members made their opinions known. Board members John Vihstad and Katie Cristol also agreed that building the driveway was ultimately the right course of action in a complicated decision. The lone voice of dissent came from Board member Jay Fisette. County Board Chair Libby Garvey had the last word on the matter. “I do believe in the end that building the road will be helpful to the environment, will improve safety and will encourage more students and their families to be walking instead of driving to school,” Garvey said. In total, the Board spend about 4.5 hours on the discussion, even though it was just a “Request to Advertise” on the “Consent Agenda” for non-controversial items. Most of the time was spent in an impromptu County Board work session; a vote on the matter is expected to take place at a subsequent Board meeting. The Stratford school building is slated to be renovated after its current primary occupant, the H-B Woodlawn Secondary Program, moves to the Wilson School in Rosslyn.